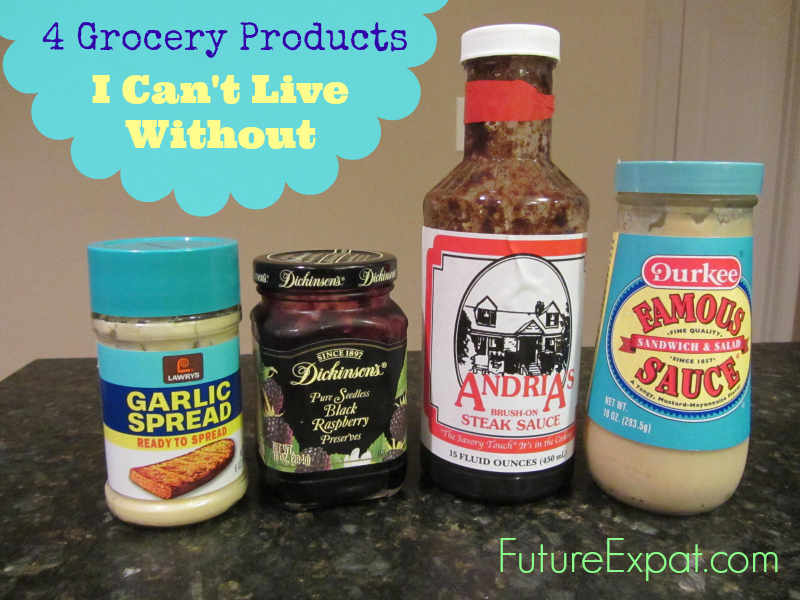 Ok, maybe stating that I can’t live without these 4 grocery products is a bit strong. But I make sure I never run out of any of these items. Each tops the list of things in the grocery store that I would really miss if they were ever discontinued, but I bet most people have never heard of any of them. 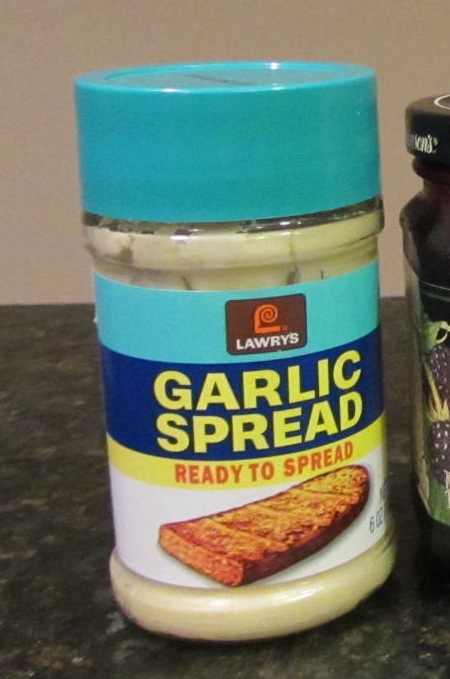 Lawry’s Garlic Spread is the fastest way to make garlic bread. Just spread some on a slice of bread and then pop it into the toaster, in the oven or on the grill, and a few moments later you have tasty garlic bread. As a kid, my Mom always used the spread on sandwich bread, covering each slice from edge to edge. My Dad liked his garlic bread to also get a coating of Kraft Parmesan cheese (the fake style…not the new shredded cheese you can buy now). If you decide to give this a try, make sure you press the cheese into the spread before it is popped into the toaster or it will all just fall off. When my mom made steak, everyone got 2 pieces of garlic toast. With a family of 6, the garlic spread and regular sandwich bread resulted in an economical way to give everyone garlic bread without buying the expensive packaged stuff in the freezer isle. My very favorite jelly is black raspberry jelly. I grew up eating Smucker’s Black Raspberry Jelly as my go-to jelly. In recent years, my grocery store stopped carrying this flavor in the Smuckler’s line, so I’ve switched to Dickinson’s. 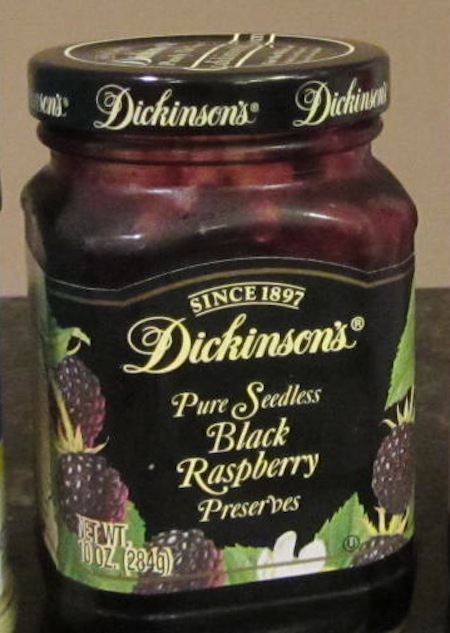 I have to say that I don’t like raspberries at all…and I don’t think I’ve ever had a black raspberry. But the jelly really is great. Nowadays I don’t do PBJ sandwiches, so I eat my jelly on toast, bagels or with matzo brie. I have to credit a short lived boyfriend for introducing me to Andria’s Steak Sauce. He brought a bottle over to my house one night when we grilled steaks and I haven’t made a steak without it since. The sauce is from a local restaurant, Andria’s Steak House and can be found in local groceries around town. If you don’t live in St. Louis, you can also buy it directly from the restaurant. The sauce is almost black and you don’t need a lot to make a great steak. I use it as a marinade if I plan ahead and have 15-30 minutes to let the steak absorb the flavors. However, I picked up a steak from the grocery store earlier this week and came straight home to make dinner. I just popped the steak onto the grill plain and poured the steak sauce over the steak. Once on the grill, I spoon a little of Andria’s on top and when I flip the steak, I spoon some more over the cooked side. I know it’s called ‘brush-on’, but I figure I already have a spoon dirty and why add one more thing to wash. I don’t add any other seasoning to my steaks…not even salt, pepper or garlic. It’s just not needed if you are using Andria’s steak sauce. In my family, this is just called Durkees. As if Durkee isn’t a brand and it is their only product. I didn’t even know the official name was Famous Sauce until I just uploaded the picture. Durkees is another thing I grew up eating. We only use it with cold chicken or turkey instead of mayo in a sandwich or as a dipping sauce (like use would use ketchup) when you have the meat directly on your plate instead of in a sandwich. It’s hard to describe the flavor, but description on the bottle is better than anything else I could come up with…”a tangy, mustard-mayonnaise flavor”. 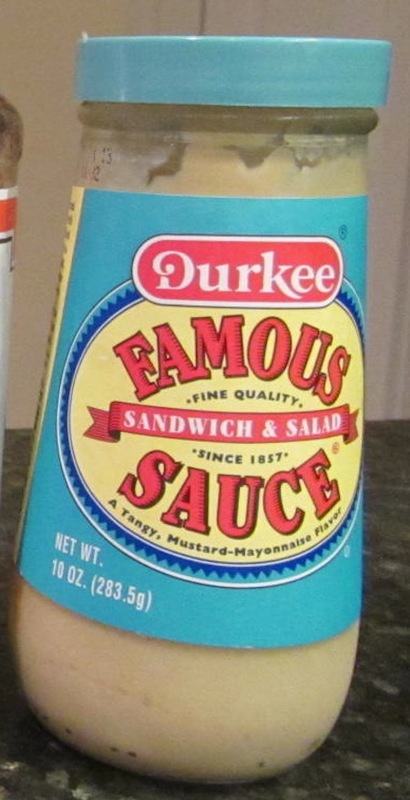 I don’t like mustard at all…but I love Durkee Famous Sauce. Do you have anything you always have on hand that isn’t a staple in every kitchen? If you do, share them below in the comments. My dad used to travel to St. Louis and every time he’d load his suitcase up with Andrea’s for the family and neighbors. There’s nothing better! Thanks for sharing at Inspire Us Thursday on Organized 31. I only discovered Andria’s as an adult. But I have eaten at Sam’s Steakhouse (owned by the same people as Andria’s Steak House) and they make the most amazing steaks!